And it only takes a moment or two to complete. CONSIDERING HOW POPULAR it is, it’s probably no surprise that complaints about Facebook’s official apps tend to occur every so often. Accusations of draining battery life and data plans being used up thanks to the introduction of certain features like autoplay videos have been thrown at the app for a while now. For most people, the app should be fine, but if you find it’s causing you trouble, the best thing to do is get rid of the app and get the mobile web version instead. The first step is to get rid of the app itself by uninstalling it. Once that’s done, you want to load up the mobile site. 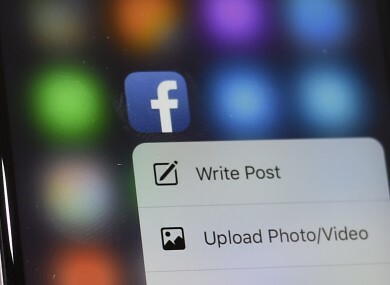 Choose your browser you use regularly – for this we’re using Chrome for Android and Safari for iOS – and sign into Facebook. Once that’s done, you want to save the page to your home screen. On Android, tap the options button in the right-hand corner and scroll down until you see “Add to Home Screen”. Select that and name your icon. On iOS, go into your browser and hit the share button at the bottom of the screen. Name your icon and it will appear on your home screen. You are sacrificing some convenience though as you won’t be able to receive push notifications – the exception would be messages on Android – so you’ll have to check if you want to see updates by keeping the app or set up email notifications. The benefits are worth it though. For one, you won’t have the same battery drain as the app itself as it won’t run in the background and the functionality is mostly the same. Even better, the mobile version also includes messaging so you don’t have to install Messenger either. Email “If Facebook's app is irritating you, there is a way to improve things”. Feedback on “If Facebook's app is irritating you, there is a way to improve things”.